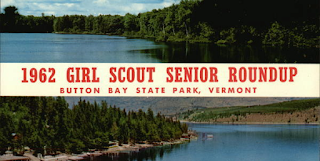 Vermont State Parks Blog reports that in 1962, the International Girl Scout Roundup took place in what is now Button Bay State Park in Vergennes. That event celebrated the 50th anniversary of the Girl Scout organization. Over 10,000 Girl Scouts participated. The returned buttons will become part of a special display in the Button Bay Nature Center celebrating the story of the 1962 Girl Scout Roundup.